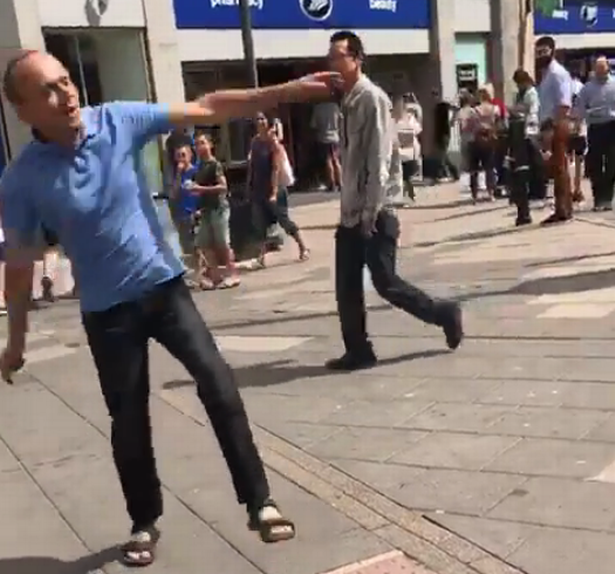 Footage of a man's joyous dancing next to a busker in Cheltenham town centre has taken social media by storm. Courtney Wilson was in High Street yesterday when she captured the music lover's impressive moves on a video which has since been viewed 96,000 times on Facebook. "Then obviously this guy came over and started dancing. He was loving life and I found it absolutely amazing yet hilarious at the way he couldn't stay away and kept running back. "It was too funny. I honestly couldn't cope. I definitely got my phone out at the right time." After the Ed Sheeran number finished, the dancer sprinted down the lower High Street, before running back when Despacito started. When this song ended, he charged down the lower High Street and did not return, Miss Wilson added. Asked if the busker found the scene before him amusing, she said: "Once he stopped playing he did. He found it funny and definitely had a smile on his face. "I would love to know who the guy is. He's honestly made my week."